Welcome to the Winter CAL 2015. Today I’m introducing the CAL, providing information on requirements and the pattern for the first square motif, a ‘solid’ granny which should be pretty familiar and which will help you estimate your own requirements if you aren’t using the same yarn. This post is rather long, so make a cuppa and settle down for a long read ! First let’s talk about yarn. I’m using a double knit (DK) yarn and I’m making 2 blankets. My first is a ‘sample’ blanket using 6 bright colours which cheer up winter and the second is also a bright colour palate but will be structured differently. I’m using the second colour set to crochet along with you. Sample yarn: John Arbon, Knit by Numbers DK, 100% merino, 100g/250m per skein. 2 skeins each of Blue (039), Pink (063), Yellow (052), Green (071) and Purple (029) and 1 skein of Orange (015). This is sufficient for a blanket 7 motifs square, so a total of 49 motifs and a small border. 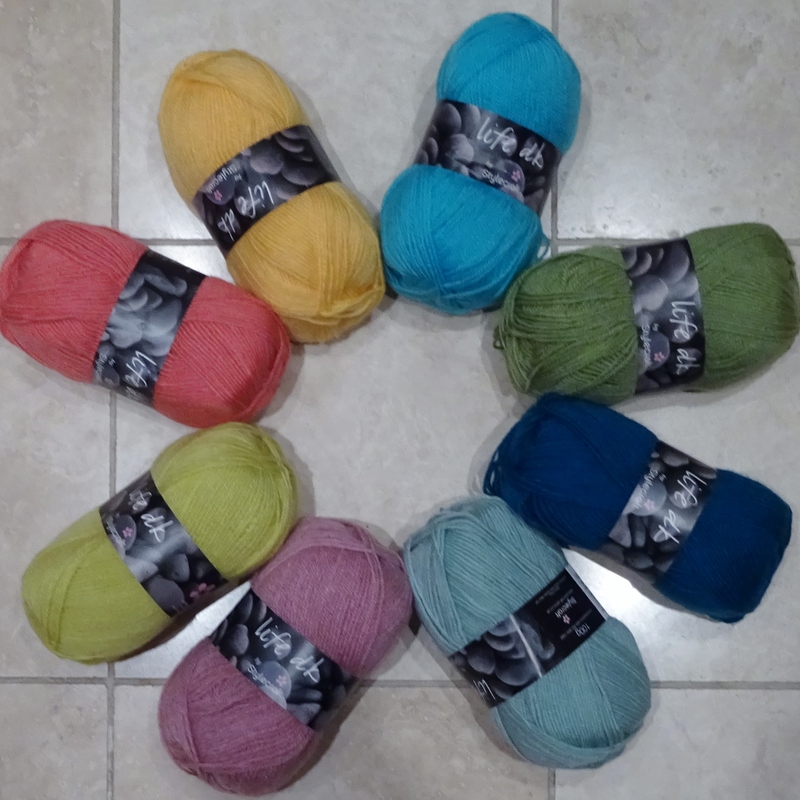 CAL yarn: Stylecraft Life DK, 75% acrylic/25% wool, 100g/298m per ball. I’m using 2 balls each of Teal (2416), Mint (2342), Aqua (2357) and Fern (2311) and 1 ball each of Daffodil (2394), Rose (2301), Melon (2359) and Zing (2356). The blanket will be 7 motifs square also, the same as the sample, but I will put a larger border on this. The motifs are square and each motif is approx. 19cm (just under 8in) square after blocking, using the ‘sample’ yarn. You can use any yarn you like, as long as you use a suitable hook size. And you can make it to any size you like. It is a perfect stash buster. Later in this blog I show you how to you estimate your yarn requirements. Some of the motifs in this design work well in just one colour, others work well in up to 5 colours. 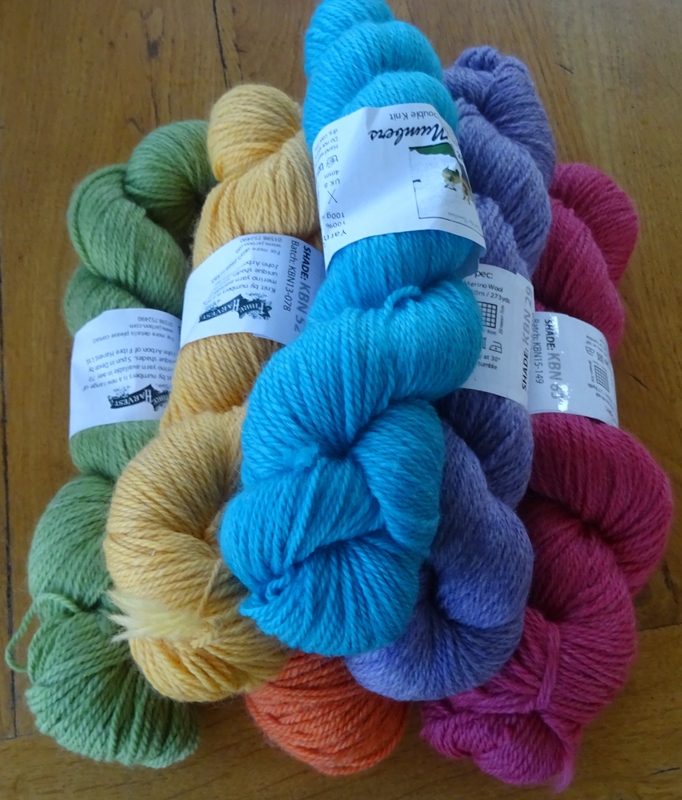 So whatever you choose, I recommend you have at least 5 colours of yarn. I used 6 colours in my sample blanket and I’m using 8 colours in my CAL blanket. There are 8 motif designs, and you can use as many or as few as you like. The first 2 designs are free and will be published on this blog, so you could use just these 2. The first design is published today, the second design will be published on 26th December. The other 6 will be published weekly thereafter and will be included in a comprehensive pattern which will be available to buy on Ravelry, it will be published initially on 26th December and updated as each motif is released. Photos of the new motifs will appear on this blog, along with my progress updates. You can make the blanket any size you like. The lap blanket I am making will be 7 motifs square – a total of 49 motifs. It will be just over 1.3m/52in square with a small border. This is an approximate way to work out your yarn requirement. First make the motif in this blog. I worked out it uses an average amount of yarn for all the 8 motifs, so is a good guide as to how much each motif will use. Then measure your motif. Using this measurement work out how big you want your blanket to be – so if the motif is 20cm and you want a blanket 120cm square then it will need to be 6 motifs square – that’s 36 motifs. I prefer my blankets to have an odd number along each side, as visually I find odd numbers more appealing. So you may prefer to aim for 7 by 7 (49 motifs), or 5 by 5 (25 motifs) or even 9 by 9 (81 motifs). For the motifs you need yarn with a total weight of N times W, but you need to add a margin for joining, colour matching/changing and a border. I recommend a minimum of 10% (which works for a small border and if you are careful with colour matching) or 20% (which works well with a larger border) or 25% (if you aren’t confident about colour matching and/or don’t really know what you want to do for a border). For my bright sample I had 49 motifs, each weighing an average of 20g – so 49 by 20 plus 10% is 1078g and the skeins come in 100g, so I need 10.78 – or 11. The estimating works if you are using all the same yarn, if you use different brands of yarn then you should look carefully on the ball band to find out how many m or yd are in each brand – they vary quite a lot. If yours vary, then you’ll have to do some more maths to work out your requirements. Essentially you need to work out the meterage or yardage of your motif, rather than just the weight. I’ll provide information on this in my Ravelry group here if you want it – so just join in the discussion and ask! This is the first motif. 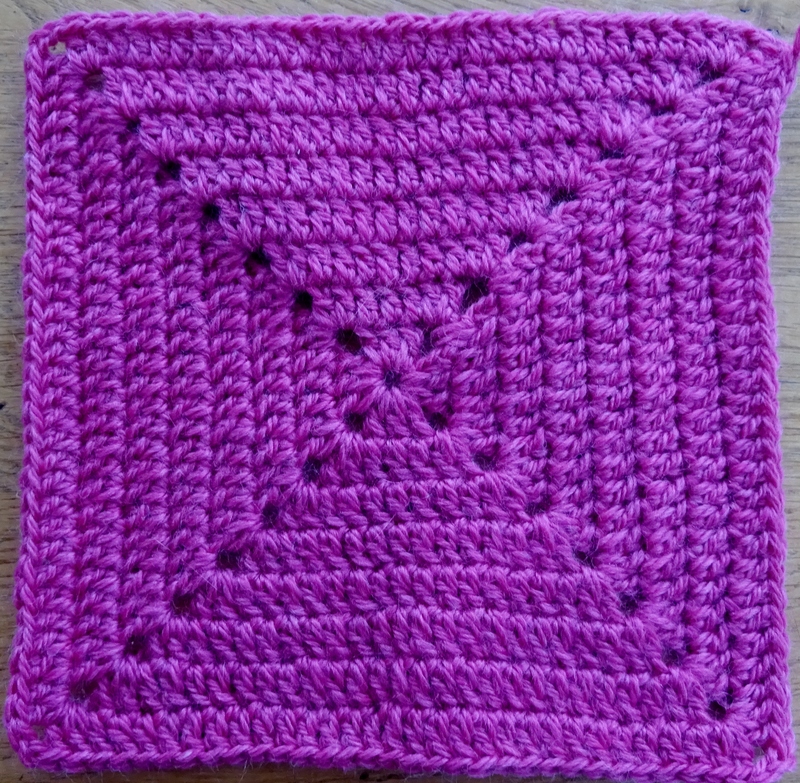 It is similar to one I used last year but this has more rounds in total, it’s a ‘solid’ granny square. Round 1: 5ch (counts as 1tr, 2ch), (3tr, 2ch) 3 times into the ring, 2tr into the ring, join to 3rd st of first 5ch with a ss. 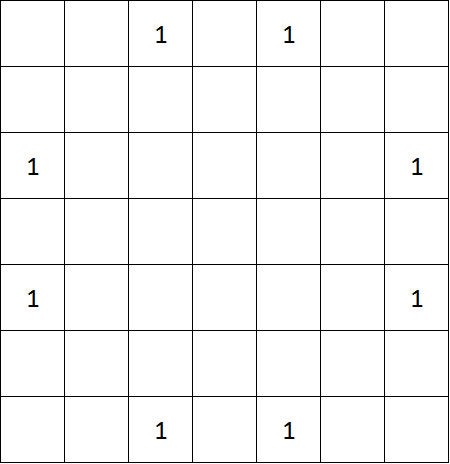 Round 2: ss into 2ch-sp, (note for this and each subsequent round: this ss is to position the start of the round in the right place) 5ch (counts as 1tr, 2ch), 2tr into the same 2ch-sp, 1tr into each tr along each side and (2tr, 2ch, 2tr) in each 2ch-sp on the corner, finish with 1tr in the first 2ch-sp where you started the round and join to 3rd ch from start with a ss. You should have 7tr along each side and 2ch in each corner of your motif. Rounds 3 to 8: Repeat Round 2. Each round the number of tr along each side will increase by 4, so at the end of Round 8 you should have 31tr along each side and 2ch in each corner of your motif. Break yarn and fasten off leaving a long tail about 3m long for sewing or crocheting together later. In my sample blanket I made 8 of these motifs in just one colour each. But you can use up to 8 colours, just by changing colour at the start of each round. I will start my CAL blanket later today and I’m planning on using at least 2 colours on each of my 8 motifs. I’ll post progress photos tomorrow. If you want to chat about this, there is a discussion thread on my Ravelry forum here. Or you could just comment on this post. Here’s the Winter Blanket CAL (crochet-along) info and Block 1 from Agrarian Artisan.